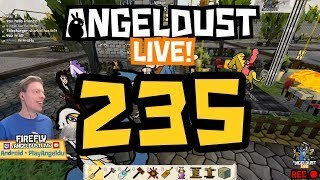 Here you'll find the Angeldust backstory, information for Let's Players and streamers, and our press kit. “For thousands of years angel Violet has been creating beautiful planets. And for thousands of years her angel brother Crimson has been destroying those planets with his giant hammer when their time had come. One day, Violet created the prettiest planet Crimson had ever seen. And Crimson knew he would never be able to destroy such a beautiful work of art. Out of sheer desperation, he swung his hammer at Violet, also hitting himself in the chaos. Both angels shattered to dust; magical Angeldust, that gently swirled towards the planet. There, it infused creatures and soil with supernatural powers. we'd love to get you playing Angeldust! Please message us on our YouTube channel!